The Model Search facility is a powerful and flexible tool for finding anything in the modeling repository. An object can be located regardless of what a user is looking for, whether it is the name of an element, text in element notes, a Tagged Value or properties such as when an element was created, who created it, what its status is, and more. The facility includes a wide range of built-in searches that can be used or a user can define their own searches using the Query Builder, SQL Builder or by defining an Add-in Search. With a number of analysts and others working on creating or importing content into the repository the number of elements will increase rapidly and before long even with a well organized model it will not be possible to remember where all the elements are located. The search facility can be used to locate information easily no matter where it is in the model. The Model Search facility can be used to find anything that exists in the repository. It can be used to return a set of elements that meet specified criteria for example in preparation for an iteration to get the list of all Requirements that were created in the last two weeks that have a Status of Validated and that have a Difficulty value of Low and a Priority of High. The result set can be sorted, documentation can be generated and individual elements can be Book Marked, or located in the Project Browser or in all the diagrams in which they appear. Searches can be used as the basis of a number of other tools such as Model Views, the Documentation Generator and more. A user can choose to use predefined searches or create their own user defined searches. Searches can be defined using three different tools: the Query Builder which is screen driven and easy for most non-technical analysts to understand or using the SQL Builder which uses SQL or by creating an Add-in Search which requires some programming. 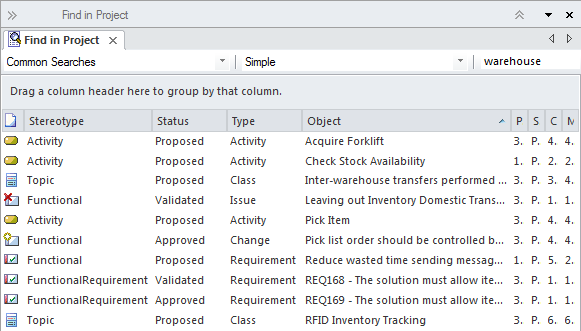 The Query Builder is the most intuitive of the tools and allows a user to build up their own query adding one or more filters to restrict the set of elements that will be returned. The Search Facility can be configured to query a single package (and its sub-Packages if required) or to search the entire Repository. 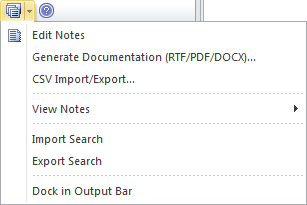 Elements returned in the search results list can also be exported to a Word Processor or Spreadsheet Document.